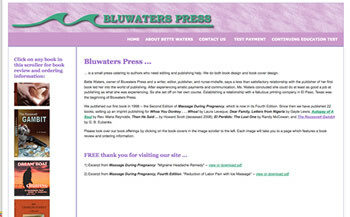 Bluwaters Press had a very old website which needed updating and to be hosted with an appropriate domain name. We researched domain name availability and registered the ones needed by this company, then revised their website to have a more updated look while retaining the flavor of the old site, improved graphics, and added the ability for visitors to buy their books in a variety of ways. Do you have a site that needs updating or re-creating? Contact us.